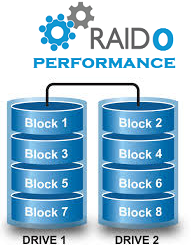 RAID 0 (block-level striping without parity or mirroring) has no (or zero) redundancy. It provides improved performance and additional storage but no fault tolerance. Hence simple stripe sets are normally referred to as RAID 0. Any disk failure destroys the array, and the likelihood of failure increases with more disks in the array (at a minimum, catastrophic data loss is almost twice as likely compared to single drives without RAID). A single disk failure destroys the entire array because when data is written to a RAID 0 volume, the data is broken into fragments called blocks. The number of blocks is dictated by the stripe size, which is a configuration parameter of the array. The blocks are written to their respective disks simultaneously on the same sector. This allows smaller sections of the entire chunk of data to be read off the drive in parallel, increasing bandwidth. RAID 0 does not implement error checking, so any error is uncorrectable. More disks in the array means higher bandwidth, but greater risk of data loss.